Such a great name - truly looks like the galaxy captured in this pendant!! Love the shape and color!!! All of Janel's work is incredibly creative!! I so admire her artistic talent!! An absolutely gorgeous set!! Thank you so much!! Smooth transaction, I'm looking forward to watching her artwork in the future on Instagram . My love for learning to work with glass grows everyday. 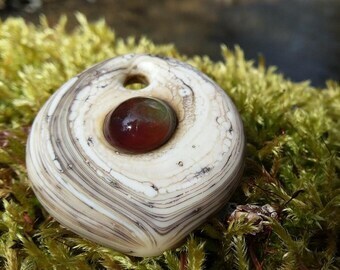 All the lampwork glass art and beads in my store are made by myself. I am on a Nortel Redmax torch. My glass work is annealed for strength and the bead holes are cleaned of bead release. I am a member of Self Representing Artist (SRA) #D-81. I accept Direct Check-out and Pay Pal. Please, NO E-checks when using paypal. U.S. shipping 1st Class - Enjoy free US shipping. Thank you for supporting my glass arts! If you need faster shipping, international tracking or would like insurance please contact me for price adjustments. Even though these beads are kiln annealed for strength, they are glass, and should be handled as so. An impact with a hard surface may or may not break them. IMPORTANT! PLEASE PLEASE PLEASE, keep loose beads away from children and pets, they can be a choking hazard.